The Truth about Faking had all the elements of a great YA book. It had a strong story line, wonderful characters and was clean enough for a teenage girl yet entertaining enough for me! I read so many YA novels with damaged characters, which I love, but I also like this type which centers around relatively normal teenagers dealing with what life throws at them. Harley (love that name) is a typical teenage girl. She worries about how she looks, finding the perfect boy who can give her that perfect kiss and wants others to like her. She is also the minister's daughter and lives life on the straight and narrow for the most part. She thinks she has her future all figured out and will one day walk down the aisle in her Greek inspired white wedding dress with braids in her hair, marrying Trent. Well, life through the eyes of a seventeen year old isn't always what it seems and she may soon realize not all dreams are meant to become reality. Trent is a great guy; he is kind, considerate and very respectable. So many girls in school want to date him but he doesn't seem to into any of them. Then Harley finds out that he may like her after all and tries to sway him her way by fake dating the new guy, Jason. Jason is the boy I would have fallen for in school. He has a great sense of humor, always listens and hears what Harley is saying, and has a playful quality. He does not fit into Harley's perfect picture; he swears, drinks, and drives a Gremlin. Through most of the book, this boy genuinely put a smile on my face! This book is a breath of fresh air and I would highly recommend it for anyone who is searching for a lighter, yet very entertaining read. I can guarantee you will fall in love with the characters while appreciating the Talbert Moore's writing style. 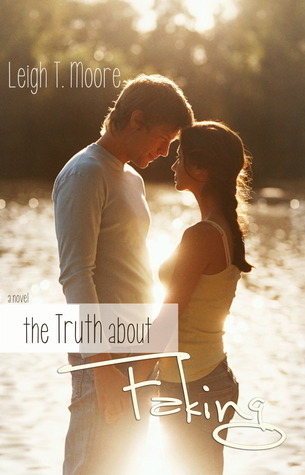 Sign into Goodreads to see if any of your friends have read The Truth About Faking. 33.0% "Jason would have been my dream boy in high school;)"
40.0% "I think I just had a light bulb moment...we will see how good my book intelligence is!"